So rich in color and character, the reclaimed Chestnut wide plank floor speaks its historic origins the most out of all the reclaimed wide plank floors. 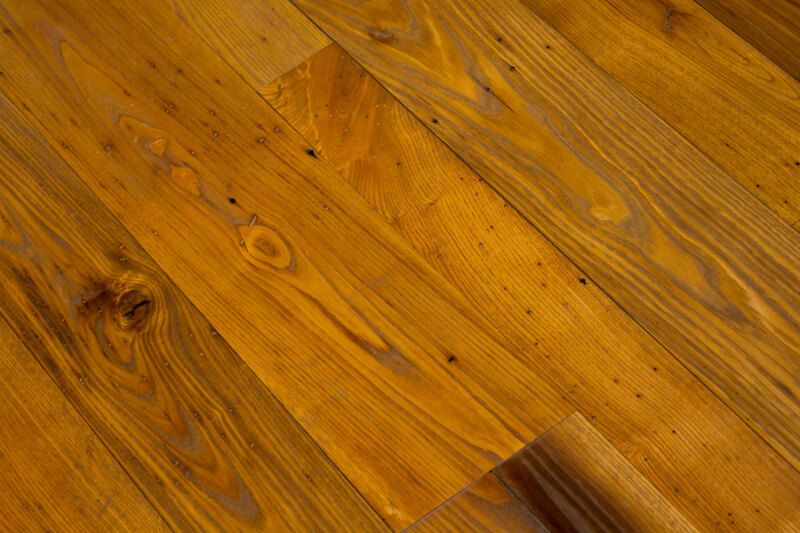 Master craftsman use this reclaimed wood to create timeless furniture and stalwart interior and exterior plank doors that enhance the beauty of this antique wood complete with wormholes and knots. Here at Bingham, we do not grade our reclaimed Chestnut. The true uniqueness and character is shown in the rich color tones, worm holes and cool undertones that vary in each and every piece. Chestnut is the perfect floor for someone looking for a unique, one-of-a-kind look from a material that is rare and only comes from the reclamation process of 100-year old structures. Each structure is carefully deconstructed and cataloged to keep its past history intact. The American Chestnut, known for its strength and size, fell victim to blight in the early 1900’s. Although 3% of the population survived and the regenerating and reforestation has begun in Appalachia, it will be decades before trees reach maturity. Therefore, this unique antique wood is only available from the reclamation of barns and rural dwellings. * Please note due to the reclamation process and the natural differences in reclaimed wood, our displays and samples are close representations of a finished product. Each floor is unique and may contain more or less characteristics than represented. Wood is a natural product and because of this, we recommend ordering samples of our products before making your flooring choice. We will send multiple pieces of each product to give a full representation of the grade and specie. Together, these pieces represent the grade, specie or product specified. Please do not reference an individual sample, piece of the sample or image as an accurate representation of the entire grade, specie, or product. Please consult your sales representative with any questions or to request more samples.